November 8, 2004: Mass Highway and the town of Maynard are holding a public hearing at 7:00 PM Monday in the Maynard Town Hall. It will be to discuss the town's request to modify an existing PWED grant, to allow some unspent funds to be used to design and build the section of the bike trail in downtown Maynard. 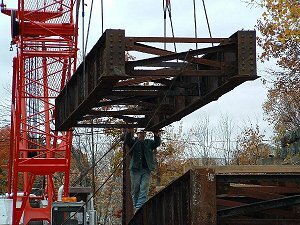 November 2, 2004: Dismantling the Hudson trestle bridge started today. It will be cleaned and painted off-site and then reassembled for the trail. More pictures like this are in the Construction Gallery page, to show progress in Hudson and Marlborough. 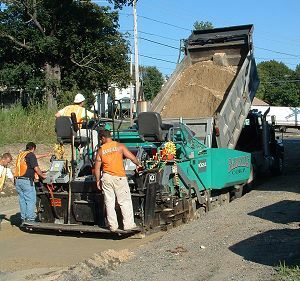 Sept 1, 2004: Spreading gravel at the Lincoln St trail head. This block is scheduled to be paved next week. 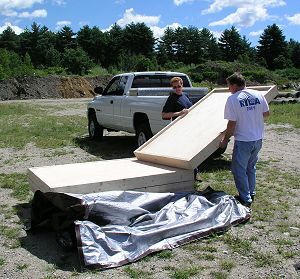 July 26, 2004: ARRT volunteers have started building the 2nd, 3rd and 4th trail side kiosks.